Due to an overwhelming amount of PR emails, I cannot attend to every PR's request that has been made. Please Note I am not a professional. Everything I review here are my own opinions and out of my own interest. We understand that our experience my not be the same to everybody else's experiences. Please consider the advice given from our posts cannot comprehend with any given guaranteed results. At Just Plain Delirious, we aim to provide our readers with HD quality images that are true to life. We understand that such technology by the camera we use - may affect the colour of our swatches. By all means, we aim to provide 100% identical swatches compared to real life swatches and colours. All images produced by Just Plain Delirious are watermarked and are usually tweaked on Adobe Photoshop CS5 Extended. 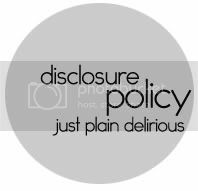 Any images taken from this blog must be credited back to this blog, as all content produced by Just Plain Delirious is copyrighted, unless stated. This blog accepts forms of cash advertising, sponsorship, paid insertions or other forms of compensation.The compensation received will never influence the content, topics or posts made in this blog. I have the right to refuse to review a product upon my discretion. We believe in honesty of relationship, opinion and identity. As an owner of this blog, the blog is compensated to provide opinion on products, services, websites and various other topics. Even though the owner of this blog receives compensation for our posts or advertisements, we always give our honest opinions, findings, beliefs, or experiences on those topics or products. The views and opinions expressed on this blog are purely the bloggers' own. Any product claim, statistic, quote or other representation about a product or service should be verified with the manufacturer, provider or party in question. This blog does contain content which might present a conflict of interest. This content will always be identified.